Year of construction 1967. 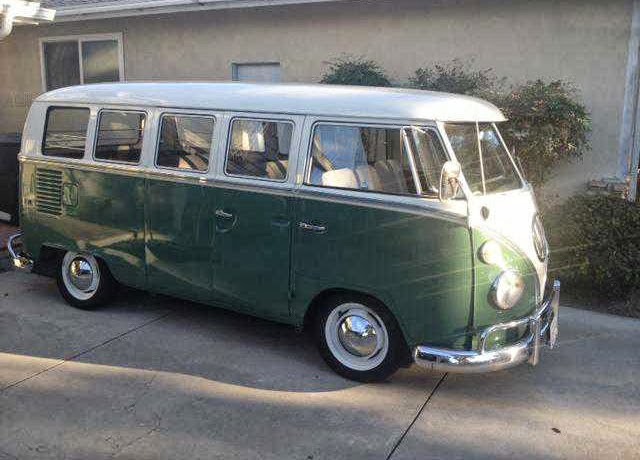 Volkswagen Bus 13 window for sale at California, Older restored more than 2 years ago, rust free, very good condition. Color combination Color Pearl White - Velvet Green. Nice smooth and glossy paint. Lowered and gone though by Russ and the guys at Old Speed. Full suspension rebuild. New Steering box. Brakes gone through with new dual curcuit master cylinder. Fresh SP 1600 built around a new unstamped case, new muffler, carb, ignition, deep sump - she is on the button and drives really well. Recently rebuilt transmission and reduction boxes (full disclosure - she is sometimes stiff to go into 3rd and 4th but does not not pop out of gear) Perfect headliner, grey cloth seats, New Seat belts. Tires have less than 500 miles on them. Has VW radio and clock but is also fitted with a good sound system. Has security ignition lockout system. I drive her every weekend but my kids are now starting to drive.